At the end of July, Sinyi Realty Inc. chairman Chou Chen-chi opened new real estate brokerage offices in Qingdao in northern China and Chengdu in western China. The new outlets represented a major departure from the company's wholly owned offices in major cities along China's eastern seaboard. They were the first of many Chou expects to launch after being invited by the China Urban Realty Association at the beginning of this year to establish joint-venture retail offices in many previously untapped Chinese cities. Chou boldly predicts that by 2020, Sinyi Realty will have 10,000 outlets in Taiwan and China. As Sinyi Realty takes on this new commercial challenge, it has also moved to an even tougher level of competition in the corporate social responsibility (CSR) sphere. Previously, the real estate broker won the top spot in CommonWealth Magazine's survey of the country's top medium-sized corporate citizens for four consecutive years, but this year it had to compete in the "large company" category, because its revenues exceeded NT$10 billion in 2010. 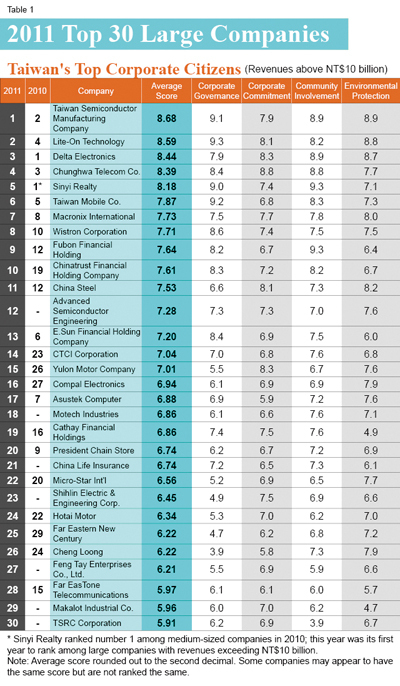 Undaunted by the change in battlefield, Sinyi Realty emerged as the fifth-highest ranked corporate citizen among Taiwan's biggest companies. "Taking a longer, broader view of the concept of profit" has been Chou's philosophy over the 30 years he has run his company, the executive said in an interview with CommonWealth Magazine in China. "Any corporate operation or corporate social responsibility is simply an expression of that concept." In other words, CSR is a dual proposition. Internally, it has to be cultivated as part of a company's corporate culture. Externally, CSR represents a company's long-term promise to the local community. To more accurately measure this promise, CommonWealth Magazine devised a more precise formula this year for its annual survey that more closely reflects international practices. The formula increased the weight of quantifiable objective data and evaluated the comprehensiveness of each company's CSR mechanisms and the depth and breadth of their influence. More companies than ever participated in this year's CSR survey, reflecting the growing acceptance of the CSR concept in Taiwan, with many enterprises now brandishing world-class CSR programs and practices. In reviewing the strategies of the most effective companies in the field, CommonWealth Magazine looked at five major questions and then analyzed, refined and brought them into clearer focus to enable even more enterprises to fulfill their social responsibility and propel Taiwan to an even more promising future. Question 1: At a time of limited resources, should CSR be concentrated in a specific area? 'Based on international precedents, a comprehensive strategy covering the four major pillars of CSR is necessary. The CommonWealth corporate citizens survey looked at four major categories – corporate governance, corporate commitment, community involvement, and environmental protection – to assess companies' CSR performance. 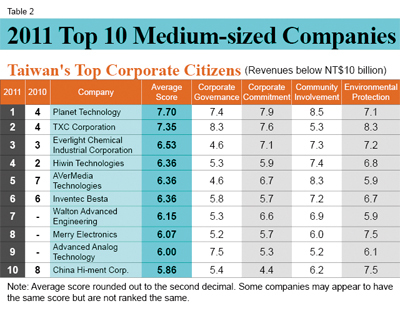 Many Taiwanese companies initially tailor their CSR programs to one of the four pillars, but to stand out in the CommonWealth Magazine survey, companies have had to push forward year after year to enhance and eventually master the other three areas as well. Chinatrust first embraced corporate citizenship 26 years ago through community involvement, organizing a fund-raising activity to help the physically and mentally challenged and the economically disadvantaged. In 2004, it extended its community focus by founding the Chinatrust Charity Foundation, which is devoted to supporting life skills education and helping those in need to get back on their feet. 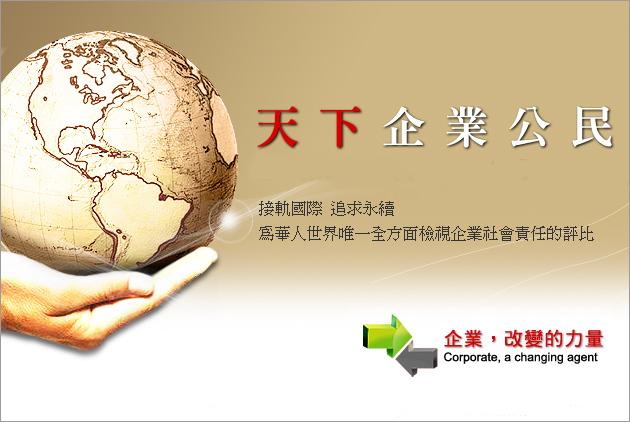 But in 2009, Chinatrust challenged itself, sending its corporate social responsibility report to the British Standards Institution (BSI) for certification. Through the process, it adopted international practices and learned new concepts and methods related to the other main pillars of social responsibility. In terms of corporate commitment, for example, Chinatrust discovered that there should be pre-determined male-female ratios at different levels of seniority within the company. In terms of environmental protection, it found that even financial institutions can enhance the environment in ways that go beyond efforts to cut carbon emissions and save energy in the office. Chinatrust reported its carbon emissions for the first time last year to the Carbon Disclosure Project, a nonprofit organization based in England that helps companies measure and disclose their greenhouse gas emissions, water use and climate change strategies. This year, it took the initiative to launch green financial products, hoping to leverage their loans into more environmentally friendly practices by their customers. In the fiercely competitive and results-oriented financial services sector, Chinatrust has been willing to challenge itself and others to take corporate social responsibility an extra step, earning itself a place among CommonWealth Magazine's top 10 corporate citizens. Question 2: Can CSR only be practiced by big companies with lots of cash? 'A good CSR mechanism does not require a big investment. For example, the CSR leader in the medium-sized company category, IP-based networking product provider Planet Technology Corporation, has developed a complete CSR structure covering all four pillars. In the community involvement area, it went so far as to set up Taiwan's first educational trust, the management and operation of which has been placed in the hands of a neutral third party. Digital multimedia video convergence leader AVerMedia Technologies Inc., which finished fifth among medium-sized companies, almost got a perfect score for "community involvement." The company not only developed performance indicators, but also used a variety of incentives to encourage employee participation, including pay for volunteer work, specialized courses and public recognition. The support of these CSR initiatives from top executives has been critical to their success, says AVerMedia Technologies spokesman Frank Wang, and when resources are limited, linking up with other groups is just as good a way to get involved. For the past 10 years, for instance, AVerMedia Technologies has teamed up with the Good Neighbor Foundation to organize cleanup activies in World Earth Day. Beginning last year, the foundation offered every volunteer a cup of coffee, increasing their desire to participate. This year, AVerMedia Technologies is working with the New Taipei City Volunteer Workers' Resource Center to qualify for the national volunteer workhour certification program. This will give the company's employees access to many benefits available from New Taipei City, serving as a tangible incentive for community involvement. Question 3: The operations of most foreign companies in Taiwan are limited to sales and services. Can they really help conserve the environment or positively impact their supply chains? 'CommonWealth Magazine's Corporate Citizen Survey emphasizes community involvement, and foreign companies have shown they can meet the standard despite the limited reach of their operations. Part of the reason for the shake-up was the added emphasis in this year's survey on gauging the impact of companies' CSR initiatives on the communities they serve. 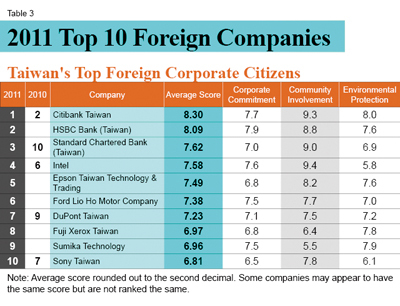 Many foreign companies in Taiwan were only able to provide global CSR data, especially those whose local operations are limited to sales and services. For one of the four main criteria, environmental protection, some multinationals could not provide local data or information on local practices. "Observing how a company's core business or products or operations interact with people and the land can provide a clear focus," says Niven Huang, the secretary-general of the Taiwan Business Council for Sustainable Development and one of the survey's judges. He notes that the international trend in gauging how effectively a company fulfills its social responsibility is to examine how companies positively or negatively affect the communities in which they operate. Some multinationals in Taiwan not engaged in manufacturing have found ways to leverage their brand image to raise awareness of environmental issues. Epson Taiwan Technology & Trading Ltd. is a case in point. At the end of 2010, the company introduced to Taiwan the "energy-saving patrol team" concept it launched in Nagano Prefecture in Japan in 2000. The initiative attracted 26 volunteers from companies such as telecom carrier Chunghwa Telecom and air-conditioning specialist Daikin Inc. to form a team offering local businesses free half-day inspections and analyses of their energy efficiency. The team has examined energy use at 15 businesses – many of them their suppliers – offering suggestions on how to conserve electricity. Seventy percent of the changes recommended did not require added costs. After a visit from the Epson "patrol team" in February, for instance, design company ARRK Dison spent NT$160,000 to install energy-saving lights on the sixth floor of its plant, adjust its electricity contract, and add energy capacitors. The moves saved ARRK Dison NT$20,000 a month, enabling it to recoup its investment in eight months. "Sales companies actually have an advantage. They can make use of their commercial network and partners to take the lead in mobilizing resources and organizing initiatives, and make their influence felt," says Coco Wang, division manager for Brand & Corporate Affairs at Epson Taiwan, who was instrumental in getting the energy patrol team off the ground. Wang expects the company to extend the service to central and southern Taiwan and to small- and medium-sized enterprises in the future. Question 4: Is the most convenient CSR strategy to set up a foundation and have professionals promote the company's image? 'CSR must be internalized into a company's genes and not simply manifest itself through a foundation or a single appearance by top executives. Chou Wen-chen, the secretary-general of United Way of Taiwan, observes that corporate social welfare practices should be fully integrated with the company's core capabilities rather than simply consisting of "sprinkling resources" equitably, donating money or organizing exhibits and contests. They should mobilize the company's internal resources and even those of other enterprises in their supply chain to create a shared long-term interest in a social issue. Many companies in the corporate citizen survey have successfully mobilized internal resources and harnessed the creativity of their employees, encouraging greater participation. At Intel Taiwan, for example, for every 10 hours of volunteer work done by its employees, the company donates US$100. In 2010, its employees put in 4,000 volunteer hours, with a participation rate of over 50 percent. Other companies, including Lite-On Technology Corporation (No. 2 among large companies) and CHC Resources Corp., (No. 10 among medium-sized companies), launched a paid volunteer system for the first time last year. At many of CommonWealth Magazine's top 50 corporate citizens that have made long-term investments in social causes, community involvement has been internalized and become an integral part of the corporate culture, to the point where bottom-up initiatives by employees are common. Question 5: How should corporate citizens respond to labor inspections and administrative sanctions? 'When dealing with oversight on labor issues, the most crucial tasks are disclosing information transparently and improving internal mechanisms. In 2010, the issues of death through overwork and occupational illness frequently found their way into the headlines, with greater attention being paid to workers' fundamental rights. The Council of Labor Affairs launched intensive labor inspections in the second half of the year to crack down on illegal practices and disciplined many high-tech companies for violating labor regulations. In the first half of 2011, the council kept up the pressure and sanctioned nearly 300 companies. It is expected to inspect another 1,000 companies in the services, financial and transportation sectors by the end of the year to see if they are overworking their employees. The frequency of labor inspections reflects society's rising standards of corporate commitment. As with people, companies are at risk of making mistakes at any time. As a result, in assessing corporate commitment, the CommonWealth corporate citizen survey looked not only at whether a company had been sanctioned by the government, but also determined through specially designed sections of the questionnaire if a company was capable of recognizing its own mistakes and making adjustments. The ability to "recognize mistakes" was reflected in a company's willingness to disclose negative information – using greater transparency to earn society's trust. The "ability to change" was demonstrated by whether disciplined enterprises changed their practices to prevent repeating the same mistake. That has grown increasingly important because while Taiwan's enterprises have shown greater maturity in addressing their social responsibility, they also face greater expectations. Louis Chen, deputy chairman of the Taiwan Corporate Governance Association, says that according to the Foundation of Taiwan Industry Service, only 8 percent of Taiwan's publicly listed companies issue CSR reports, far behind the rate in Japan (35 percent) and China (33 percent). Recent scandals linked to improper corporate behavior also reflect the standards companies must now meet. In May, the discovery of a toxic chemical – DEHP – in many processed foods and drinks sold in Taiwan sent consumers into a panic as they wondered what was safe to ingest. Meanwhile, the Formosa Plastics Group's huge petrochemical complex in Mailiao, Yunlin County, has been hit by seven fires in the past year, stirring anger among nearby residents. Both incidents demonstrated that society's trust in the private sector depends on companies avoiding complacency day after day and taking their social responsibility seriously. Every one of the four key CSR pillars not only represents the responsibilities companies have to society but has become essential to maintaining public trust and sharpening their competitiveness.